Please note that this piece was written some years ago and details will have changed. You can however still fish for marlin aboard the Pasador fishing out of Tauranga. The link is in the text. 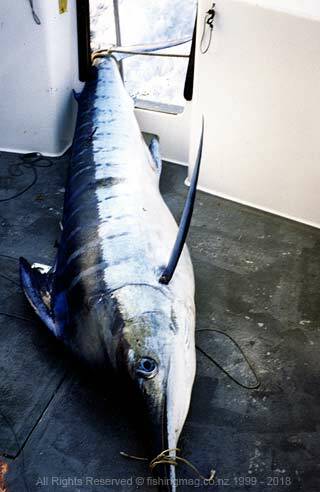 Skipjack tuna like this specimen where a marlin’s favourite meal that year. trolling and live-baiting for marlin comes first. I am very lucky to be a deckhand on board one of Tauranga’s top charter boats Pasador skippered by Rod Sheannan. Each season I get to experience the thrill of a summer’s day while cruising around searching for marlin and hopefully catching one for the charter party. There are a few times however when you have a few days off to relax. I had done it before successfully and we were well prepared (Well we thought we were anyway). Each day we always run the boat to charge the batteries and to keep the freezer chilled down to prevent anything spoiling. It only needs a couple of hours but because we are out there we might as well make the most of it. A couple of days previous Rod and I had spent a few days in Whangaroa for a change of scenery. Not a lot of fishing was done while we were there so we were very excited when we left. The decision was made to head to North Cape due to the amount of marlin that were caught over the last few days. Once out at sea, a small problem was going to stop our journey. It was not rough weather, instead, it was dead calm. Now you must be wondering what on earth would stop us reaching North Cape and the hundreds of marlin that were waiting to be caught. Well, one simple explanation Broadbill Sword-fish fish. The weather was so calm that we decided to do a night drift off Cape Karikari over a group of knolls known as the Garden Patch. So the boat was pointed towards the Patch that was some thirty miles away. Upon arriving at the Garden Patch we worked the area for marlin in the remaining daylight. It was not long before a strike came. 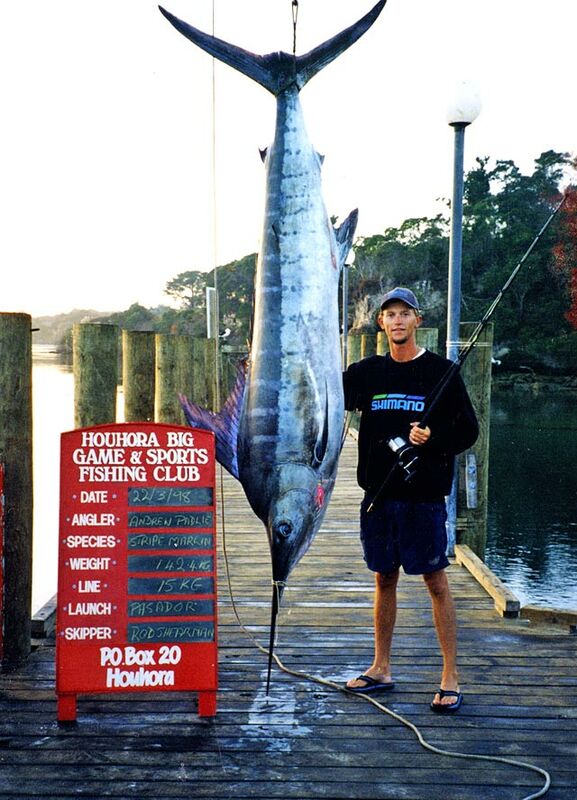 This magnificent stripped marlin took on more than it could handle when it grabbed the author’s skipjack tuna. We were right in the middle of the Patch when the centre outrigger sprang down and released the line from its clip. I did not see what had hit the lure but what it was, had not hooked itself. Jumping down from the ﬂybridge I quickly reset the lure. The unseen fish came charging back on the lure again. It was a marlin and it was hungry for plastic. The marlin was doing its best to inhale the lure so I helped it by dropping the lure back into the marlin’s mouth. After twenty metres of the line had left the reel I pushed the lever to strike. The line released from the roller troller and the reel spun a couple of times before stopping as the fish left the water throwing the hook at the same time. Simple as that! After a couple of circuits around the area, the fish did not return. It was getting late in the afternoon so some baits were rigged for the drift. As the light faded two baits were in the water. A small skipjack tuna and a large squid, both rigged with a single 12/0 hook and seven metres of 500lb mono. The skipjack was set at a depth of around 100 metres, the squid around 40 metres both rigs were weighted and had Cyalume sticks attached to the trace. To cut a long story short, we only had one strike all night. It was from a Mako shark around the 120kg mark that liked the look of the squid bait. Luckily the hooked pulled 10 minutes into the fight. Rod and I were not worried at the loss at all. There is nothing worse than dealing with big sharks at night, especially with just two on board. The only other bit of excitement occurred in the morning when a whale around forty feet long decided it would surface less than five metres from the stern of the boat. It scared the crap out of me, how it did not become tangled in the line amazed me. Even though the night was calm, we did not get much sleep due to the watches we took keeping an eye out for other vessels and waiting for strikes. It was decided to head towards North Cape, into the bay for some sleep. Then head out that afternoon for a troll. I did not get a lot of sleep in the bay as I spent most of my time catching kahawai on the fly rod. I even got to tangle with a kingfish of around 10kg on 4kg tippet. Things did not last long as a thing I call a wizz bang occurred. You are all familiar with it. You know when you hook up momentarily before being busted off on the bottom. Well anyway, it was fun and that’s fishing. After checking the oil and having a quick lunch, we rounded the Cape and headed for an area the locals call the Hook. The Hook is out around the 100 to the 200-metre mark of Tom Bowling Bay. This year a lot of marlin were caught there including Reel Passi0n’s 1000 lb blue marlin. About nine miles off the Cape there was a group of birds working so we headed towards them. Upon reaching the area we came across a broadbill ﬂoating on the surface. It was minus its tail and bill and only had half of its trunk left. that the culprit that chewed on this broadie was still circling it but not eating at all. This Mako was about 200kg’s in weight and looked awesome in the water. We decided to leave it with its prize the only reason was the thing charged the boat when we got to close to the broadie. That was one mean Mako shark and normally we would have had a go at him. Only it was not a good idea with just two of us. as they passed through the large four-metre swells. I mentioned this to Rod who told me to put a small lure out for them. I could not be bothered stopping to catch one. the rod in the holder and helped Rod bring in the bigger gear. By the time all the gear was in, I was harnessed up and nearly all the line had gone. With only a few metres of line left Rod started backing the boat towards the fish. Rod kept backing but with a single engine boat backing is very hard and we were not getting anywhere. Something had to be done and fast if we were going to have a chance. Seen we were only on 15kg using a stand-up outfit the decision was made for me to reach the bow. 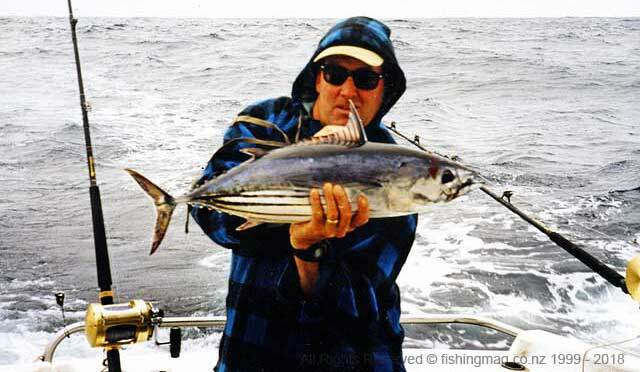 It was no easy task with the four-metre swells and loaded rod with a marlin on the end. Scrambling up the side of the boat the line was getting dangerously low. Luckily, Rod, had the boat swung around by the time I reached the bow. Once there Rod had to run ahead at seven knots so I could gain line and even at times that was not fast enough. This was one serious marlin. It put on a brilliant display leaping all over the ocean. For over an hour the marlin put on a tough fight by constantly swimming away from us and changing direction regularly. Once the fish was close to the boat there were a few close calls that almost saw the marlin gain its freedom. One of those moments was when the fish changed direction and went under the boat. Quick thinking and a dash to the bow had the line cleared with the fish still connected. Now normally a fish would not have a chance to go under the boat but we were trying to get close to it to get a good gaff shot. Most of the time we will trace a fish but in this situation, we only had 2001b trace. We were unsure as to how much the marlin’s bill had damaged the trace. On about the fifth attempted the marlin came up on its side. Rod managed to position the boat perfectly and he was able to place the gaff into the fish. Yes, it was ours and what a fish too. It was a beautifully striped marlin and a good sized one at that. What a mission it was pulling it on board. Once aboard, a closer look revealed that the hook had not even gone into the fish instead the 200lb mono was half hitched around the marlin’s bill. The marlin had practically lassoed itself the poor thing probably did not know what was happening. Obviously, it was not that marlin’s day. 142.4kg’s. A beautiful fish and a very happy angler I was indeed. It just goes to show that we fisher people do get lucky from time to time. Wish I could say the same about the Lotto as well. Remember it can happen to anyone. The author with his skipjack stealing stripped marlin.